Seven electoral alliances are running in the first stage of the parliamentary elections slated for 18-19 October, the High Elections Committee (HEC) announced in a statement on Saturday. 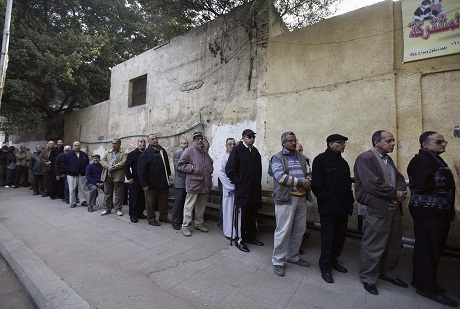 There are four lists contesting 15 seats in the West Delta, which are the Salafist Nour Party, Fi Hob Misr list (for the Love of Egypt), Forsan Misr (The Knights of Egypt) and the combined electoral list of the Egyptian Front and the Independence Current. There are another three lists contesting 45 seats in north, middle and Upper Egypt: Nadaa Misr (the Call of Egypt), Al Sahwa Al Watnya (the Natinal awake) and Fi Hob Misr. The breakdown of the 60 party-based seats will go to the two constituencies as follows: the north, middle and Upper Egypt constituencies, which include 11 governorates, will elect 45 MPs. They will be divided as follows: Giza (11), Fayoum (4), Beni Suef (3), Minya (6), Assiut (5), New Valley (1), Sohag (6), Qena (4), Luxor (2), Aswan (2), and the Red Sea (1). WHO CAN ASKE FROM UNITED STATE?